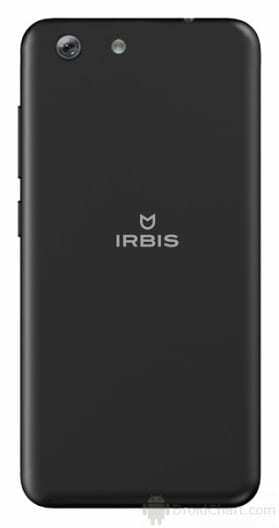 Irbis SP453 has been launched by the Russian company as an affordable smartphone for those on a very tight budget. The device is perfect for extremely light or single app users. It comes with low-class specs and a portable screen as expected, retails for a giveaway price as well. Heavy apps users that love to bargain can check Smartphones with the Best Discounts here. Without further ado, meet the Irbis SP453. What is Irbis SP453 Price and Availability Status? The budget smartphone sports a removable Plastic back that’s smooth and comfortable to hold. As we can see from the photo above, there’s no rear fingerprint scanner or loudspeaker whatsoever at the rear. The rear camera is present at the top left corner, while the LED flash sits to the left, a little far off if you ask me. Even though it measures 9.3mm in thickness, it weighs just 122g, making it very easy to hold and operate. In terms of coloring, you can only get it in Black colors. From the front, we can tell it’s a budget smartphone no doubt. Houses so many annoying bezels which is obviously not so attractive. The bottom bezel houses three navigation buttons, for navigating through the device, while the top bezel houses the selfie camera and speaker grille. The 4.5-inch TFT FWVGA capacitive touchscreen is just there and won’t be displaying any magical visuals. With a resolution of 480 x 854 pixels and 218 pixel per inch density, the visuals might not be that great. The screen stretches up to 62.8% screen to body ratio. Behind the screen is the MediaTek MT6580M chip with Quad-core processor and 32-bit CPU architecture. The 4-cores of processor runs at a speed of 1.3GHz with 28nm process technology for a smooth ride. Handling graphics is the ARM Mali-400 MP2 graphics processor with 2-Cores and clocks at 416MHz. Multitask light apps with 1GB RAM with a memory speed of 533MHz. Then store files, apps and games in the 8GB storage space which is upgradeable up to 32GB with a memory card. The Irbis SP453 runs on Android 7.0 Nougat operating system. Sitting at the rear is a 5MP shooter that captures 2K resolution images. The camera comes with a LED flash and other features, capturing photographs with 2582 x 1936 pixels in dimension. Record videos of 720 pixels at 30 frames per second and take cute selfies with the 2MP selfie camera. Powering the Irbis SP453 is a 1600mAh Removable Li-Ion battery with no fast charging technology. Even without the fast charging feature, it shouldn’t take up to 1.5 hours to fully charge up the battery from 0% to 100%. The Irbis SP453 will be available on Shopping stores from May starting from $39 (N10,000) to $69 (N20,000). Click on the links above to view the latest Irbis SP453 price & availability on Shopping stores.